From an interior illustration (the frontispiece, if you prefer) from the Amelia Rules! Vol. 3: Superheroes trade paperback. I've been a big fan of Amelia Rules! 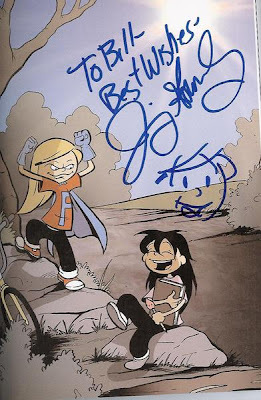 from the beginning, so it was great to meet Jimmy in person at the 2007 New York Comic Con and thank him for all the great comics. More info on the man and this fantastic all-ages book can be found here. Okay, not all of it's scary, because I really, really want these Classic Series Doctor Who figures (at least the Doctors themselves, anyway... even the Colin Baker figure looks awesome), but this? 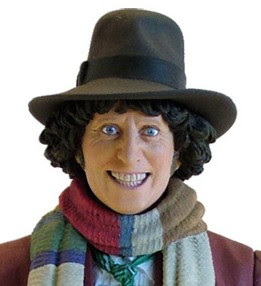 Make the terrifying Tom Baker go away!!! Thankfully he comes with an alternate, unhatted, kind of morose looking, and significantly less unexpected pee inducing noggin that you can snap on instead. Oh yeah, before I forget. So yeah, that didn't happen. Monday Morning YouTube Blogging - Pensive! Lo, there came... a pre-order! He's Part Outlaw, Part Hero.